Irish charm features a real shamrock that is encapsulated in acrylic. No two shamrocks are identical! 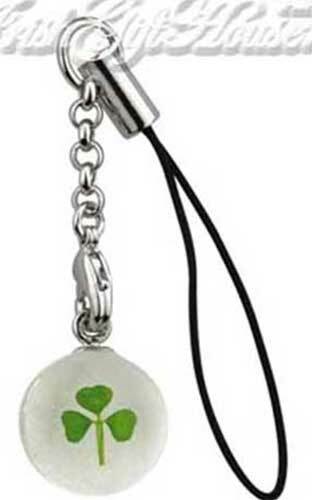 This real shamrock charm features a steel chain along with rhodium plated accenting. The 1/4" thick shamrock charm measures 3/8" diameter; it is attached to a lobster claw catch. The Irish charm is made by Solvar Jewelry in Dublin, Ireland and it is gift boxed with a shamrock history card, complements of The Irish Gift House. Shamrock clip on charm is cast in sterling silver and features a lobster claw clasp.